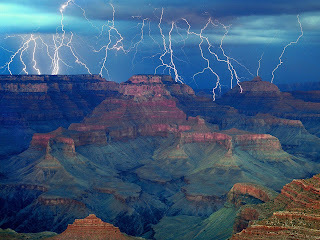 The Grand Canyon is a colorful steep-sided gorge carved by the Colorado River in the U.S. state of Arizona. 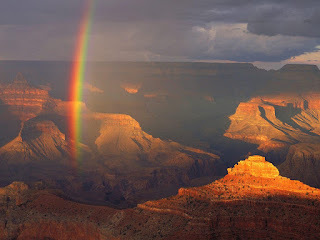 It is largely contained within the Grand Canyon National Park — one of the first national parks in the United States. President Theodore Roosevelt was a major proponent of conservation of the Grand Canyon area, and visited on numerous occasions to hunt and enjoy the scenery. 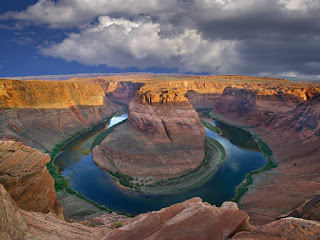 The canyon, created by the Colorado River over 6 million years, is 277 miles (446 km) long, ranges in width from 4 to 18 miles (6.4 to 24 kilometers), and attains a depth of more than a mile (1.6 km). 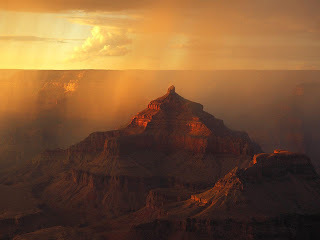 Nearly two billion years of the Earth's history have been exposed as the Colorado River and its tributaries cut their channels through layer after layer of rock while the Colorado Plateau was uplifted. 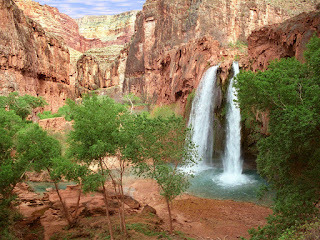 During prehistory, the area was inhabited by Native Americans who built settlements within the canyon and its many caves. 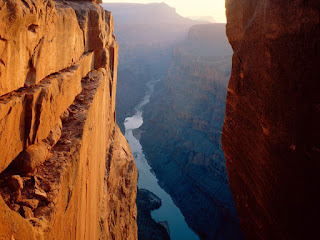 The first European known to have viewed the Grand Canyon was García López de Cárdenas from Spain, who arrived in 1540. 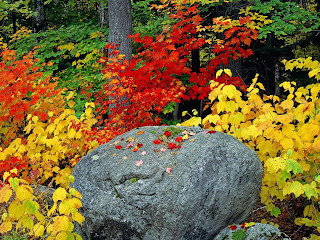 Autumn is the only season where it's easy ti pick clothes, without worrying that it will be too hot or too cold. Summers and winters are unbearable, you can be completely naked and it's still hot, or wrapped up in wool blankets, but when it's cold it's cold. Spring is competition, but spring time is unpredictable, because although you feel just fine, the weather is warm and sunny, the next day you got the flue.Not to mention all the allergies. Autumn in New York. I really like this movie. And it kinda has to be autumn to watch it. The weather. It has everything except snow. Sunny days with wind, yellow leafes and rain, sunny days and rainy nights, thunderstorms. 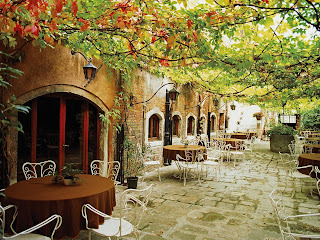 But what I appreciate is a suuny day with a little stronger breeze and coffee with friends in a cafe by the lake. 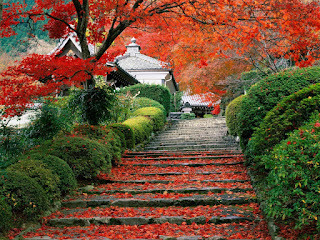 Autumn is romantic by nature. New love's first kiss in the rain is classic. My advice is skip going to work any way you can, even lie if necessary and go for a prolonged weekend in the country. Students, it's not like you have to go to classes, invite the girl/guy you've always wanted to, for a coffee or just a walk, autumn has it's way of "fixing" stuff. 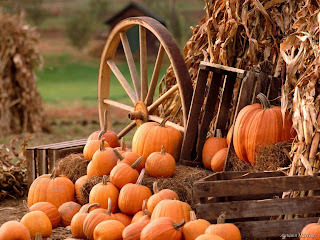 Enjoy the autumn and the ambiance it creates, because soon winter will come and spoil it all. 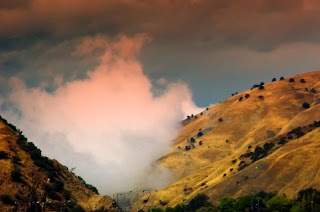 If you ever find yourself in Lebec, California I suppose there are a lot of things to see and visit (like the Fort Tejon and the Oak), but if I ever find myself in Lebec, I'll make sure I visit the Black Magic Alpaca Ranch. The ranch owner is Rachelle Black, the coolest blogger ever (Pasture Musings), with the best sense of humor. I ran in to her blog by accident and now I am a regular visitor, because the alpaca magic has enchanted me. Alpacas are truly amazing creatures, often called ships with long necks , but in fact they resemble a spotless fawns more likely. In August Rachelle held a contest on her blog, an alpaca naming contest, and the prize was a scarf made from alpaca fleece. 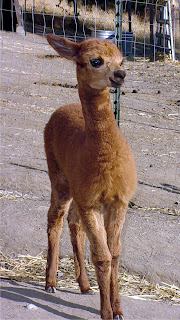 And so we gathered all Tolkien fans from around the world to name the newborn cria at Rachelle's ranch, not as much for the prize, but just the pleasure of giving a name to that little cute creature. And a name was picked, Elbereth , Lady of the Stars. So, that's why "in honor of life", because every little vibrant atom that drives this planet counts, because every single creature matters, because we are all part of each other. And we proved it because people from miles away gave the best of them to give a name to new life. The twin temples were originally carved out of the mountainside during the reign of PharaohRamesses II in the 13th century BC, as a lasting monument to himself and his queen Nefertari, to commemorate his alleged victory at the Battle of Kadesh, and to intimidate his Nubian neighbors. However, the complex was relocated in its entirety in the 1960s, on an artificial hill made from a domed structure, high above the Aswan dam reservoir. on the The relocation of the temples was necessary to avoid being submerged during the creation of Lake Nasser, the massive artificial water reservoir formed after the building of the Aswan damNile River. 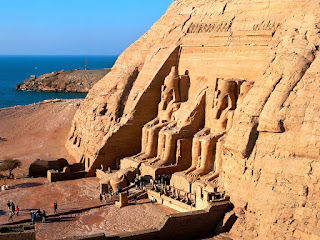 Abu Simbel remains one of Egypt's top tourist attractions. With the passing of time, the temples became covered by sand. Already in the 6th century BC, the sand covered the statues of the main temple up to their knees. The temple was forgotten until 1813, when Swiss orientalist JL Burckhardt found the top frieze of the main temple. Burckhardt talked about his discovery with Italian explorer Giovanni Belzoni, who travelled to the site, but was unable to dig out an entry to the temple. Belzoni returned in 1817, this time succeeding in his attempt to enter the complex. He took everything valuable and portable with him. Tour guides at the site relate the legend that "Abu Simbel" was a young local boy who guided these early re-discoverers to the site of the buried temple which he had seen from time to time in the shifting sands. Eventually, they named the complex after him: Abu Simbel. 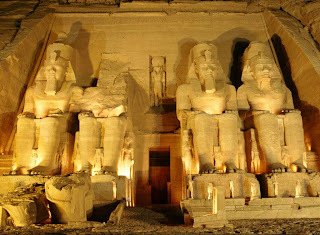 The salvage of the Abu Simbel temples began in 1964, and cost some USD $80 million. Between 1964 and 1968, the entire site was cut into large blocks, dismantled and reassembled in a new location – 65 m higher and 200 m back from the river, in what many consider one of the greatest feats of archaeological engineering. Today, thousands of tourists visit the temples daily. Guarded convoys of buses and cars depart twice a day from Aswan, the nearest city. Many visitors also arrive by plane, at an airfield that was specially constructed for the temple complex. Goblin Valley is a State Park in Emery County in central Utah, in the western United States. Its eminent feature is its formation of thousands of mushroom-shaped rock pinnacles, some as high as several meters. The distinct shape of these rocks comes from an erosion-resistant layer of rock atop softer sandstone. Portions of the 1999 film Galaxy Quest were filmed in the park. 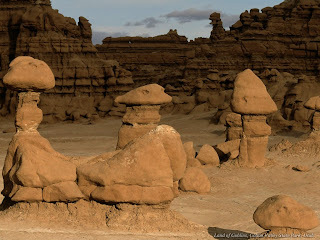 The secluded Goblin Valley was first discovered by cowboys searching for cattle. Then in the late 1920s, Arthur Chaffin, owner/operator of the Hite Ferry, and two companions were searching for an alternate route between Green River and Caineville. 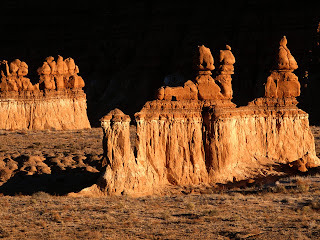 They came to a vantage point about one mile (1.6 km) west of Goblin Valley and were awed by what they saw – five buttes and a valley of strange-shaped rock formations surrounded by a wall of eroded cliffs. 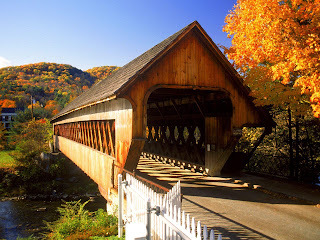 In 1949 Chaffin returned to the area he called 'Mushroom Valley'. He spent several days exploring the mysterious valley and photographing its scores of intricately eroded rocks. Publicity attracted visitors to the valley despite its remoteness. In 1954 it was proposed that Goblin Valley be protected from vandalism. 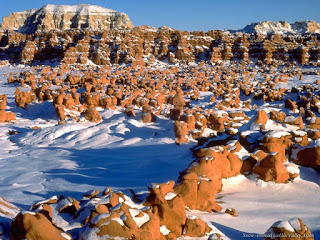 The state of Utah later acquired the property and established Goblin Valley State Reserve. 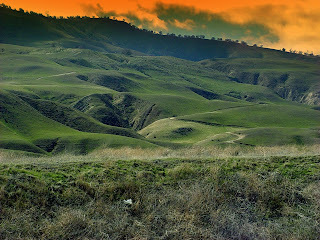 It was officially designated a state park on August 24, 1964. The grotesque stone shapes in Goblin Valley result from the weathering of Entrada Sandstone. They consist of debris eroded from former highlands and redeposited on a former tidal flat of alternating layers of sandstone, siltstone and shale. The rocks show evidence of being near an ancient sea with 1) the ebb and flow of tides, 2) tidal channels that directed currents back to the sea and 3) coastal sand dunes. Vegetation is limited to hardy desert species that can endure blowing sand and hot dry surface conditions. 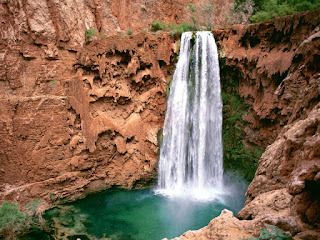 Vegetation and wildlife exist on a limited supply of water in the arid desert environment. Plants have adapted by reducing the size of their leaves to reduce evaporation, with some having a waxy coating on their leaves that reduces water loss. Flora occupying Goblin Valley include Mormon tea (joint fir), Russian thistle, Indian ricegrass, and various cacti. Juniper and pinyon pine grow at slightly higher elevations.